This page links you to free recipes on websites and blogs written by people following a whole foods plant based (WFPB) diet. There are also some excellent recipe books you can purchase. These recipes differ from standard vegan resources in that they are all advocating a whole foods low-fat/no added oils diet. 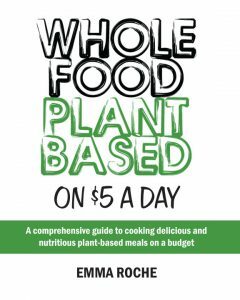 PlantPlate – Includes articles with practical advice and tips for eating a whole food plant-based diet by Emma Roche. Recipes are adapted for Australian ingredients. We recommend her two eBooks: Whole Food Plant-Based on $5 a Day which include 28-day meal plans, shopping lists and prep guides. Also check out her Guide to Plant-Based Batch Cooking. Cooking With Plants – Anja Cass. See also on YouTube and Facebook. Dr McDougall’s Health & Medical Center – Links to hundreds of free recipes prepared by Mary McDougall. See the Printable McDougall Recipe Cards and the McDougall Newsletter Recipes. 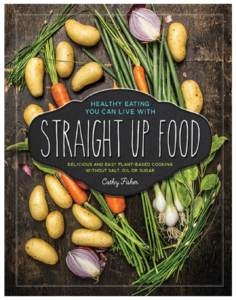 Straight Up Food – Cathy Fisher’s website is one of the best for sugar, salt and oil-free whole food, plant-based recipes. Cathy works with the McDougall program and at TrueNorth Health. Her 2016 cookbook is excellent for newbies and if you want to avoid shipping costs you can purchase a PDF version. See also on Facebook. Forks Over Knives – Provides nearly 400 recipes from various plant-based chefs and cooks. Download the Forks Over Knives Recipe App to your phone – contains more than 300 recipes and includes shopping lists. Also a Forks Meal Plan subscription available. T Colin Campbell Center for Nutrition Studies – has many recipes contributed by graduates of the Plant-Based Nutrition Certificate, various plant-based chefs and by members of the Campbell family. The Culinary Gym – Katie Mae is a cooking instructor at TrueNorth Health and for the McDougall program so her recipes are all sugar, salt and oil-free. She has a mix of free and ‘premium’ recipes on her website. If you sign up for her monthly or annual subscription you receive her eBooks, all recipe content including video demonstrations. Happy Herbivore – The Happy Herbivore, aka Lindsay Nixon, writes a regular blog featuring low-fat vegan recipes and includes Q&A’s about plant based eating, and has great tips for getting started. She has US$5 meal plans for sale, and is the author of five bestselling cookbooks. See also on Facebook. FatFree Vegan Kitchen – Has a great recipe index. See also on Facebook. Engine 2 Diet – Engine 2 is the creation of former firefighter Rip Esselstyn (son of Caldwell Esselstyn, Jr., MD). The website has a favourite recipes section and a blog with meal ideas and recipes. See also on Facebook. Jeff Novick is a dietitian who posts useful nutrition and cooking tips on his Facebook page. He also has a website but he updates his Facebook page more often. He has produced several nutrition information and cooking DVDs which you can purchase from VegSource. Nutriplanet – Nele Liivlaid is from Estonia, but currently lives in Barcelona, Spain. The website has many recipes for free, and you can purchase a weekly meal plan for 7 Euros or a 4-week plan for 20 Euros. Klunker’s Kitchen – No oil, plant based. Offers whole food, plant based recipes, developed to help others shift to a new health enhancing, nutritional paradigm, a whole food, plant based diet. The Vegan 8 – kid-friendly recipes – All recipes are vegan, gluten-free, oil-free and nut-free, or with a nut-free option. Some recipes may contain coconut. Healthy plant-based recipes that kids will like too. By Emma Roche, an Australian author (2017). This is an excellent introductory book. It has meal plans and lots of useful advice for those new to eating this way. Available as an eBook and as a printed book. There is also a Summer edition – you can link to all these versions on the PlantPlate website. By Cathy Fisher (2016). This is our favourite recipe book. It is expensive to have shipped to Australia and most of the recipes are freely available on Cathy’s website, but if you were only going to buy one whole food plant-based recipe book we recommend having this one in your kitchen. The recipes are salt-oil-sugar free and full of flavour, and the book is full of useful tips for transitioning to a WFPB lifestyle. Order from Straight Up Food website (US$35 + shipping). By Dr Michael Greger, Gene Stone and recipes by Robin Robertson. This book has some exciting recipes and is packed with nutrition hints. By Kim Campbell (2017). Kim’s second cookbook is becoming everyone’s favourite. By Kim Campbell (2015). A companion book to the film PlantPure Nation. By chef Del Sroufe (2013). Delicious low-fat plant-based recipes. An excellent book for those trying to lose weight. Order Kindle edition from Amazon. By chef Del Sroufe (2015). Delicious, simple whole food plant-based recipes. Includes meal plans. Ann Crile Esselstyn & Jane Esselstyn (2014). Over 125 healthy plant-based, oil-free, nut-free recipes that follow the Esselstyn “plant-perfect” diet for reversing heart disease. Contains some unique recipes written in a fun style. This is the first of four books by Lindsay Nixon, aka Happy Herbivore. Recipes are low-fat, plant-based and she includes recipes such as Cheddar Cheesy Sauce (vegan), Tofu Scramble and Black Bean Brownies – useful for those looking for substitutes for their old dietary ways. Features recipes from many countries around the world. By Leanne Campbell (2013). Official companion to The China Study by T Colin Campbell. By chef Del Sroufe (2012). Contains over 300 plant-based recipes. By Dreena Burton (2015). Over 100 kid-tested, whole foods vegan recipes. Includes tips for pleasing picky eaters and school lunchbox solutions. See also: Introductory WFPB Books that include large recipe sections.